"Drawing from the Visible World," an exhibition of work on paper, paintings, and sculptures by JASON ALDEN, PAUL BOWEN and MYLES DANAHER, will be on view through Thursday, April 27, at the 118 Elliot Gallery in downtown Brattleboro. The opening reception will be held during Gallery Walk on Friday, April 7, from 6:00 to 8:00 p.m. Otherwise, weekly gallery hours are Thurs.-Sat. from 2:00 to 6:00 and by appointment—call gallery director Lisa Mendelsund at (802) 257-2757 for further information. Each of these artists has an intimate connection to the things he sees, recalls, and imagines with care and refined attention. All three encourage the viewer to see everyday objects and surroundings from a fresh perspective, whether it is the flattened plane of a table in Alden's paintings, the diamond-shaped holes in a bridge in Bowen's drawings, or the late afternoon sky framed by the dark forms of trees in Danaher's work. JASON ALDEN, originally from Boston, has been exhibiting his work locally and teaching drawing and color mixing to adult students at the River Gallery School in Brattleboro for over ten years. He will be exhibiting paintings and drawings. Alden, who primarily paints from his imagination, has a modernist's affinity for the "flattening of perspective." There is a mesmerizing pull in his paintings toward the white tables, whose edges both veer and tilt away from the viewer. His oil paintings, he explains, are "imagined constructions of figurative objects." Alden continually puts in, then removes, objects and shapes so that these re-workings and re-imaginings are felt by the viewer, like glimpses from a painter's working diary. Alden's drawings of trees, which Mendelsund described as "fast and tramping and brambly," are made with a carpenter's pencil in one hand and a pen in the other. 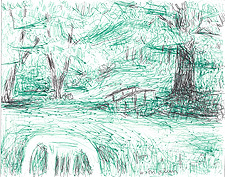 Alden primarily draws outside, by the brook or in the woods. He always draws from life, but rather than creating a direct representation of the things he sees in nature, he is more interested in capturing "the visual and felt qualities" of those things. PAUL BOWEN said, "Most sculptors use drawing as a stimulus for ideas and to resolve technical problems, but I also look at structures in the landscape." Bowen will primarily show drawings of bridges in the area and also will be exhibiting several sculptures that trace his long connection to found, scavenged, and salvaged materials. Bowen, who lived in Provincetown, Mass., for 30 years and whose work is represented there at the Albert Merola Gallery (as well as Garvey Rita Art in W. Hartford, Conn.), has been a resident of southern Vermont since 2005. His sculpture, which is in private and public collections both nationally and abroad, largely has been made from water-worn wood he has collected along the beach and, more recently, rivers. He has developed signature techniques and familiar elements in his work, such as "tails," arcs, or ribs of wood which jut out or float away from the main body of the sculptures, and hand-sculpted "butterflies," which are his main method of joining sections of wood. 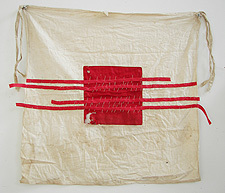 In this exhibition, he will show several wall sculptures, including one made from an old marine signal flag and another from an oilskin stretched across embroidery hoops. As an avid fisherman in his childhood in northern Wales, Bowen wore this raincoat when fishing off a Victorian Pier whose battered pilings would resurface in similar form, years later, in many of his drawings of Provincetown's piers and wharves; the remembered and observed piers of Bowen's two former seaside homes are felt still in his recent drawings of weathered wood slats of Vermont's covered bridges. MYLES DANAHER, who has exhibited his work at Catherine Dianich Gallery and other local venues for 20 years, said, "Painting is a conversation with the natural, material world." As for the other two artists in this exhibition, discovery is often found in the process of creating the work itself, where, as Danaher noted, "mistakes can be a virtue." Danaher, who has worked for many years en plein air to paint oil-on-canvas landscapes, now primarily paints from photographs and memory. 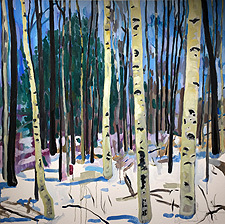 His work has a stylistic range from representational to more lyrical and abstract, but in all his work, the viewer is left with a lingering sense of the totemic power of Vermont's trees, mountains, and the light and shadow cast on and around them, particularly as they are filtered through the eye and hand of a practiced, deeply engaged painter. Danaher also will show walnut-ink-and-watercolor drawings. The 118 Elliot Gallery, at 118 Elliot St. in Brattleboro, is a modern, multipurpose environment for the creative arts, educational talks, and special-event rentals. Art exhibits at the gallery are curated by director Lisa C. Mendelsund and present a wide array of art work from artists throughout the region.